Silver River Basement Systems can test for radon gas levels in your home and if they are above the recommended levels, we can customize a radon mitigation system to fix the problem. With input from you, a mitigation system can be designed and installed to effectively bring home radon gas down to a safe level. 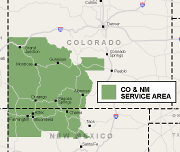 We serve the Colorado & New Mexico area, including Greater Grand Junction.